The North Cascade elk herd is the smallest of ten herds residing in the state. It is a small herd and the northern most herd in western Washington. Nevertheless, it is an important resource that provides significant recreational, aesthetic, and economic benefit to Washington citizens and a valued cultural, subsistence, and ceremonial resource to the Native American people of the area. This is a reintroduced herd resulting from successful augmentations in 1946 and 1948 of eastern and western Washington elk. The estimated peak population of 1,700 elk occurred in 1984. Since then, the population has sharply declined to a current estimate of about 300 elk. The core population in the Nooksack game management unit occupies about 1,230 square kilometers (492 square miles). 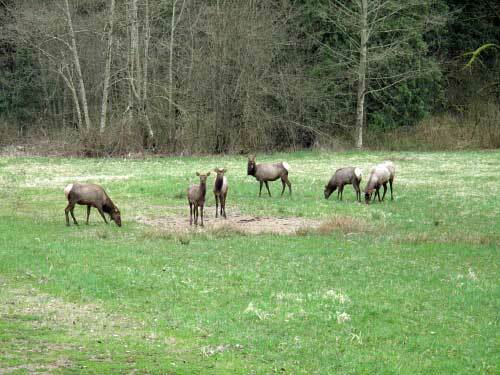 About 125 other elk live in the agricultural lands along the Skagit River; the remaining elk live in the higher elevation, forested lands north of the Skagit River. You see small groups every so often but to see a whole family together with 12 members is a rare treat. They kept their distance as I approached but as long as I stayed 500 feet away, they were content. A few kept watch but most were feeding on the new grass shoots. This page contains a single entry by DaveH published on April 10, 2009 8:13 PM. Simpsons Stamps was the previous entry in this blog. Awww Cute - the new Honda Element is the next entry in this blog.